Hershele is a poor orphan living in a small town yeshiva (study house). He has a sharp mind, is an accomplished Talmud scholar, and possesses a beautiful singing voice. Everyone believes he is destined to become a great rabbi or cantor. Mirele is the bright, headstrong, and beautiful daughter of a rich widow. She is destined, through a traditionally arranged marriage, to be the wife of a well-to-do doctor or merchant. Everything changes, however, when the two naïve teenagers are brought together by Mirele’s mother’s reluctant good deed: providing Hershele with a weekly charity meal in her home. Unexpectedly, Hershele and Mirele fall in love. 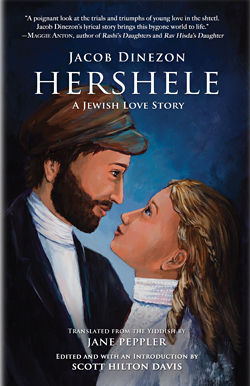 Set in a small shtetl town in Eastern Europe in the 1880s, Hershele: A Jewish Love Story reveals the sweet and touching details of Hershele and Mirele’s courtship, the heartrending obstacles that stand in their way, and the dramatic events that ultimately challenge their budding relationship. Dinezon wrote poignant stories about Eastern European shtetl life and focused on the emotional conflicts affecting young people as modern ideas challenged traditional religious practices and social norms. He was also a staunch Yiddish advocate and a highly respected community philanthropist. Jane Peppler is an award-winning singer and musician, musical historian, and Yiddish translator. She has translated Yiddish stories by Sholem Aleichem, Mendele Moykher Sforim, and three novels by Jacob Dinezon: Hershele: A Jewish Love Story, Yosele: A Story from Jewish Life, and Alter. 1. In reading Jacob Dinezon’s novel, what surprised you most about Jewish life in the 19th century? 2. What modern similarities or differences do you see in Dinezon’s depiction of class conflicts between rich and poor in the shtetl? 3. Mirele’s mother reluctantly performs the mitzvah (good deed) of providing a weekly charity meal to a poor student? Would you be willing to feed a poor student at your table once a week? 4. Should Mirele have deceived her mother by writing the fictitious letter from Hershele’s aunt? Should Hershele have gone along with Mirele’s deception and taken her money? 5. Should Hershele have helped Shlomo the matchmaker get food for Passover by going to Borekh the butcher’s home for at least one Passover seder? 6. What happens to Hershele after he is led away at the end of the novel? Will he ever return to Mirele? What will become of Mirele? 7. If Mirele’s uncle had accepted him, how would Hershele’s life have been different if he had married into their rich family? 8. What did you think of Dinezon’s ending? Did it surprise you? Did you feel it was appropriate? Can you see any hope in it? 9. Dinezon was called the “Father of the Realistic Jewish Romance.” How does this book, written in 1891, differ from the depiction of romance in modern novels? 10. Can you imagine yourself in an arranged marriage? What would be the advantages and disadvantages? Can an arranged marriage be as happy and fulfilling as a marriage based on romantic love?